My camera had a possibly-fatal accident in the field at the end of the day on Saturday, so I didn’t take any photos on Sunday or Monday. From here on out, you’re either getting my slides, or photos taken by other people. 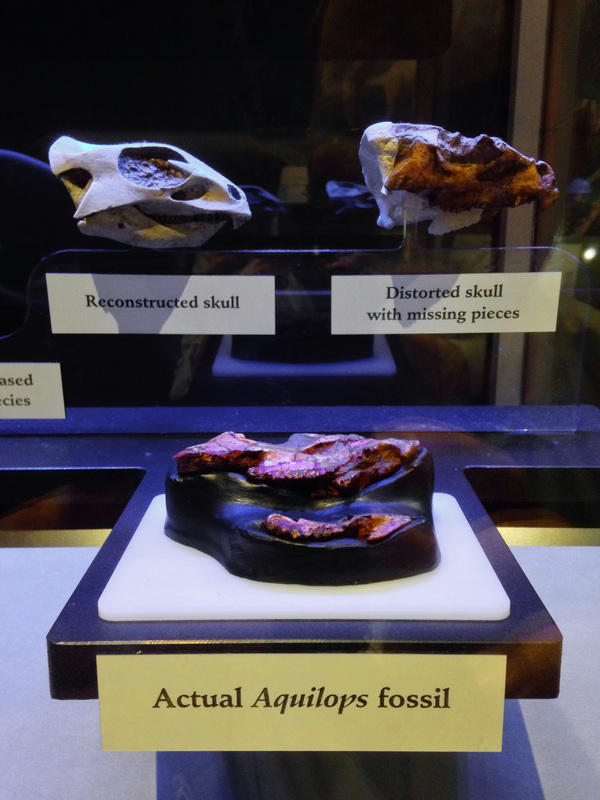 On Sunday we were at the John Wesley Powell River History Museum in Green River, Utah, for the Cretaceous talks. 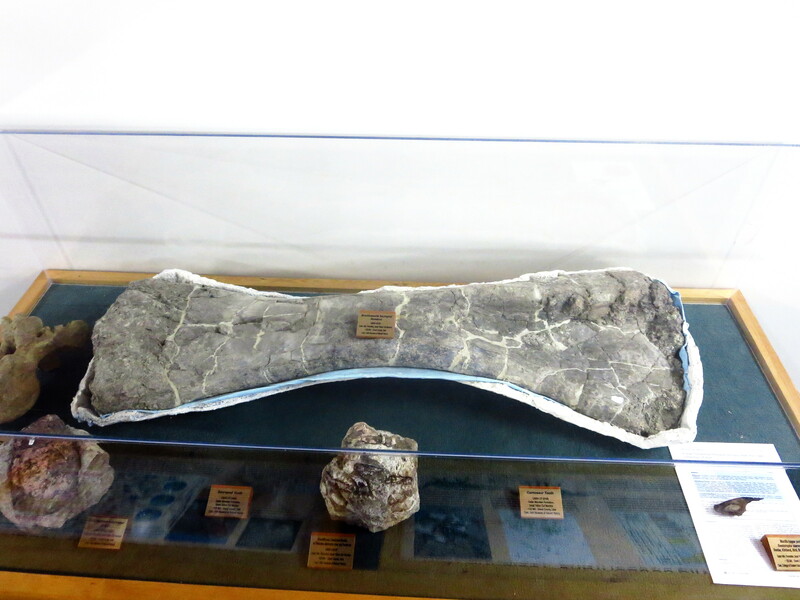 There were some fossils on display downstairs, including mounted skeletons of Falcarius and one or two ornithischians,* and this sauropod humerus from the Cedar Mountain Formation (many thanks to Marc Jones for the photo). 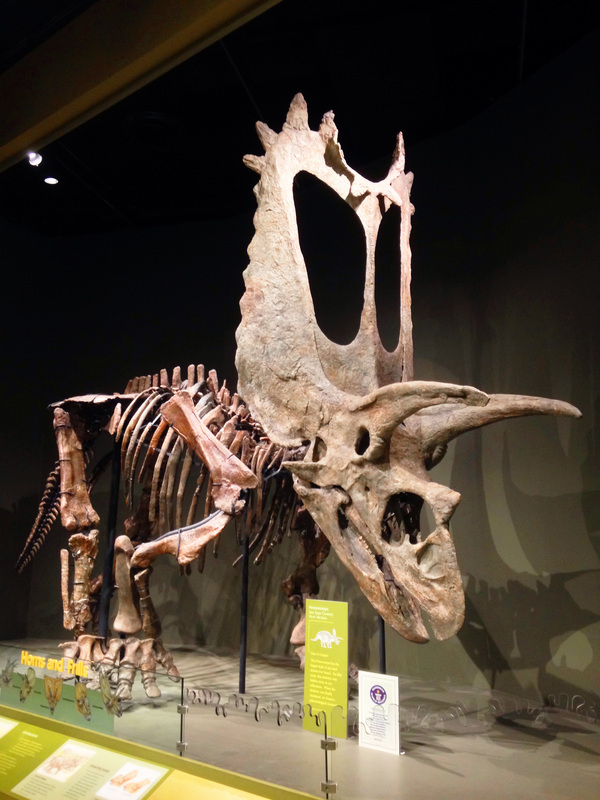 * A ceratopsian and Animantarx, maybe? 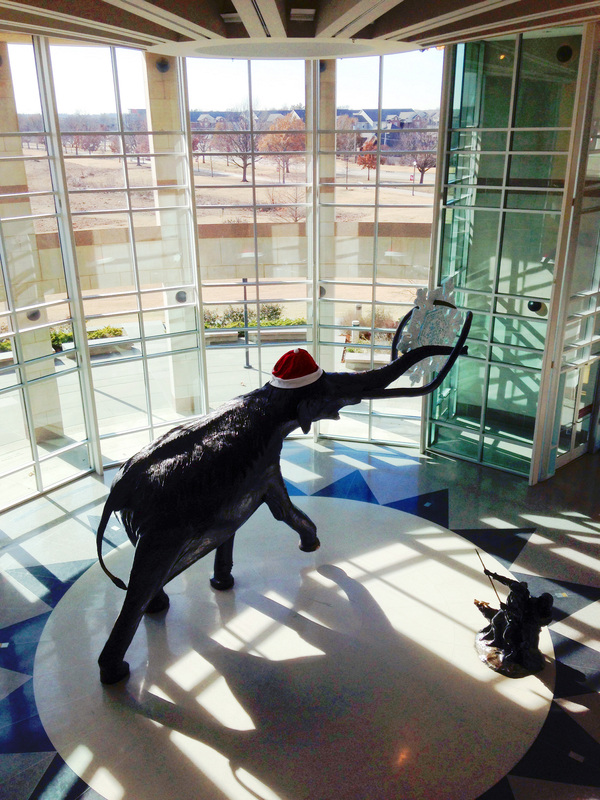 They were in the same room as the sauropod humerus, so it’s no surprise that I passed them by with barely a glance. There were loads of great talks in the Cretaceous symposium on Sunday, and I learned a lot, about everything from clam shrimp biostratigraphy to ankylosaur phylogeny to Canadian sauropod trackways. But I can’t show you any slides from those talks, so the rest of this post is the abstact from Darren’s and my talk, illustrated by a few select slides. 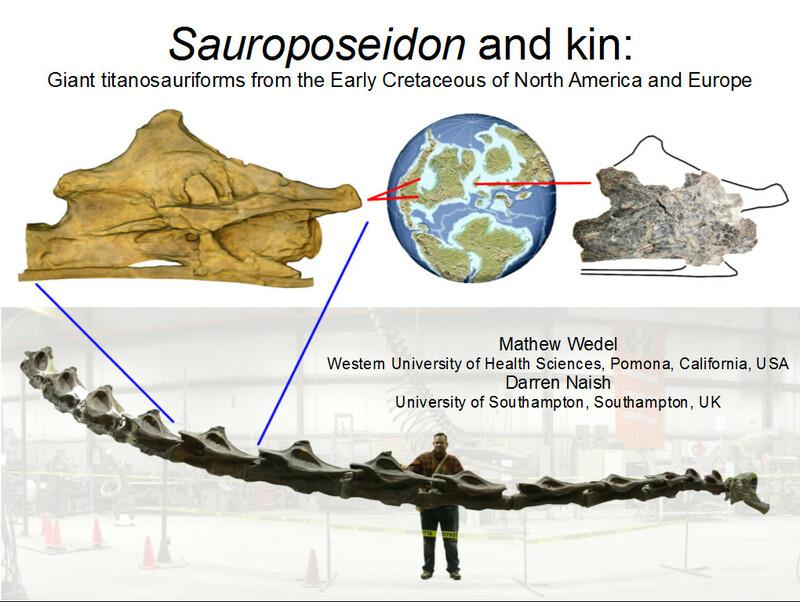 Sauroposeidon is a giant titanosauriform from the Early Cretaceous of North America. 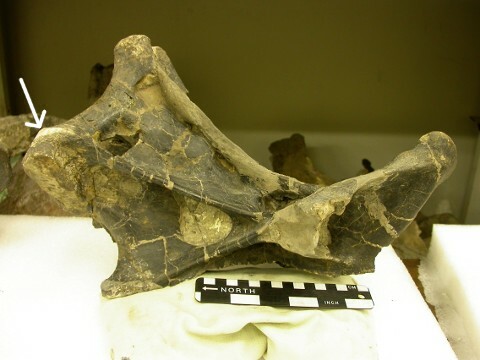 The holotype is OMNH 53062, a series of four articulated cervical vertebrae from the Antlers Formation (Aptian-Albian) of Oklahoma. 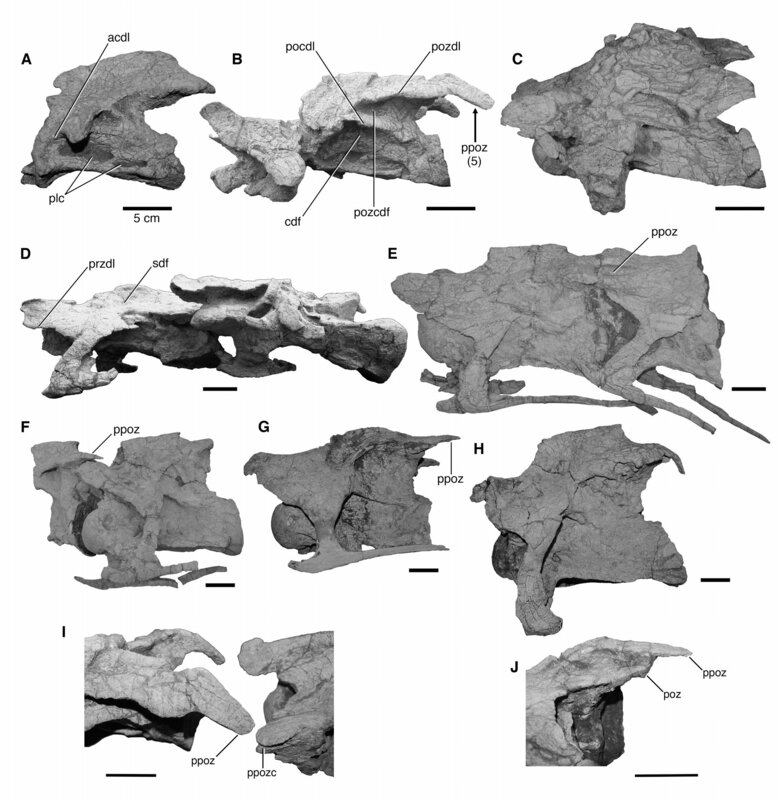 According to recent analyses, Paluxysaurus from the Twin Mountain Formation of Texas is the sister taxon of OMNH 53062 and may be a junior synonym of Sauroposeidon. 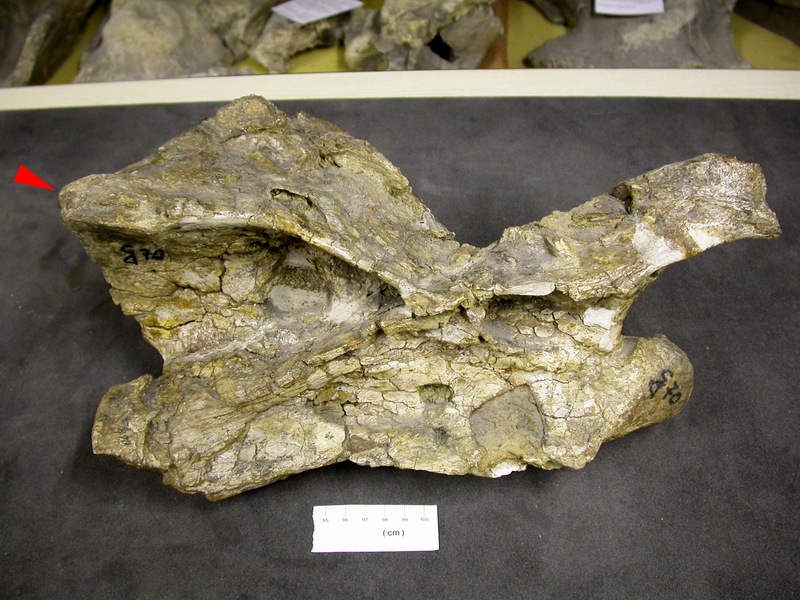 Titanosauriform material from the Cloverly Formation of Wyoming may also pertain to Paluxysaurus/Sauroposeidon. 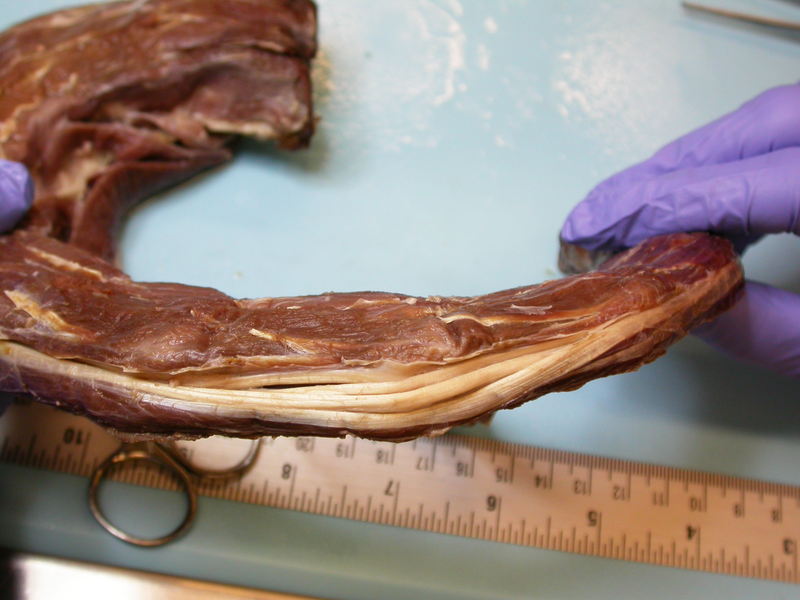 The proposed synonymy is based on referred material of both taxa, however, so it is not as secure as it might be. 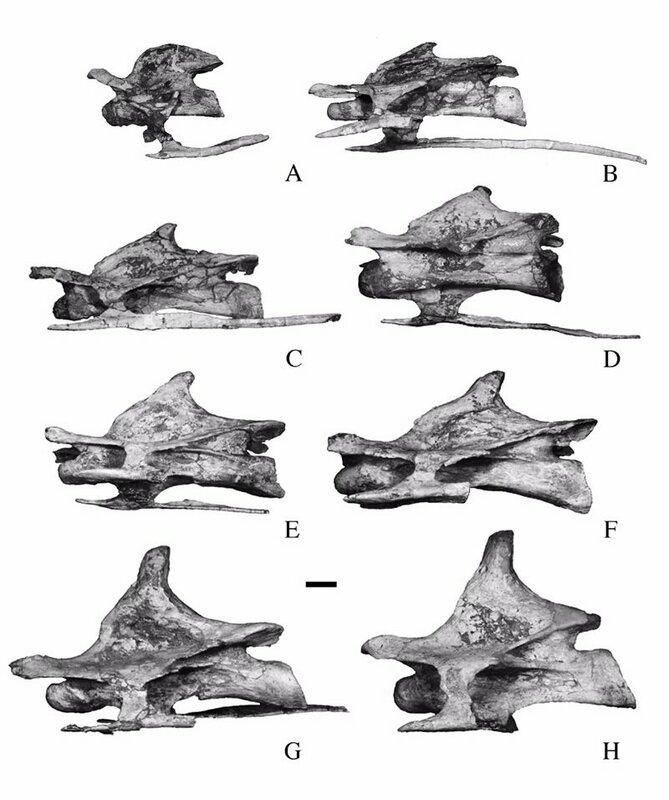 Top row, vertebrae of Paluxysaurus. 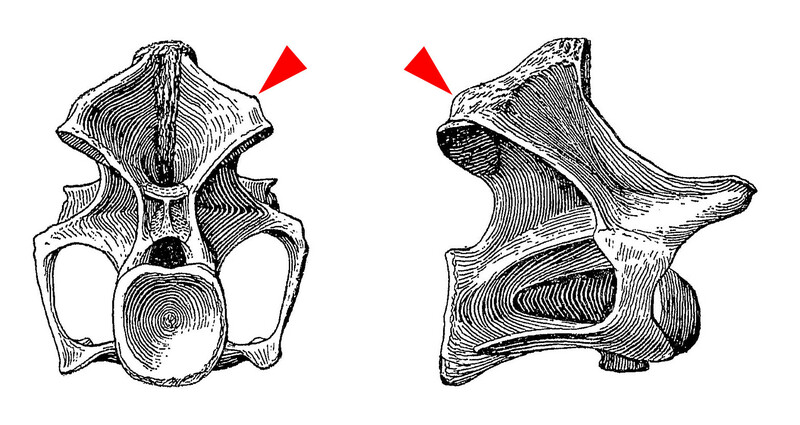 From left to right, the centrum lengths of the vertebrae are 72cm, 65cm, and 45cm. 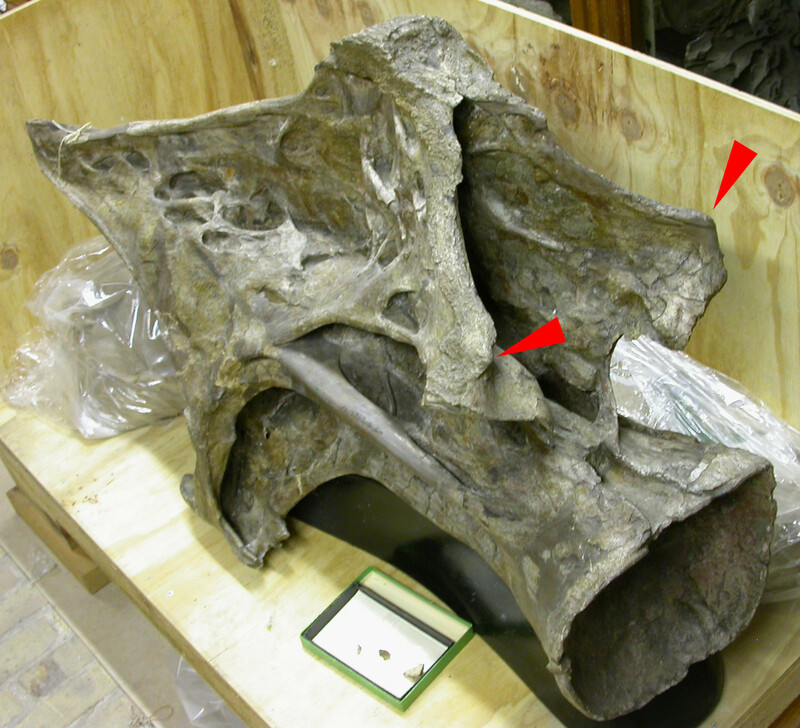 Main image, the largest and most complete vertebra of the holotype of Sauroposeidon. 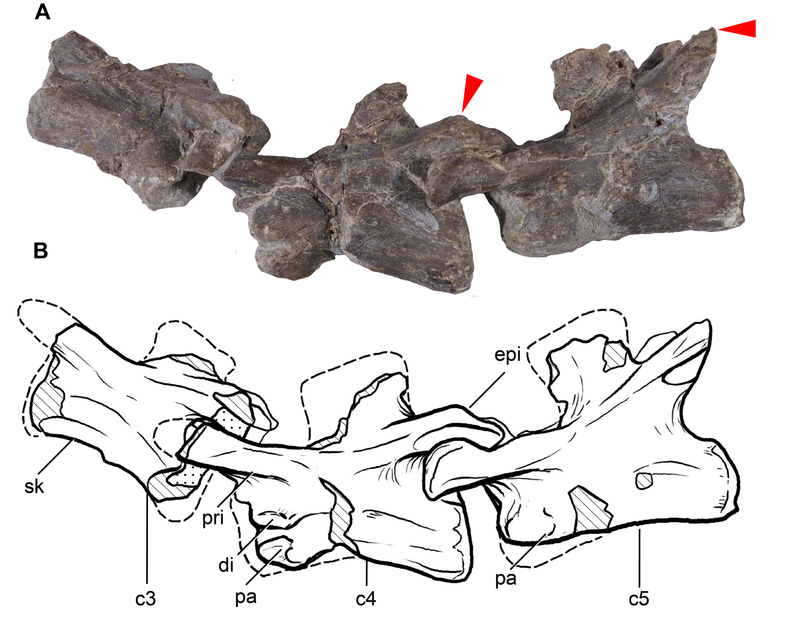 Labels call out features that are present in every Sauroposeidon vertebra where they can be assessed, but consistently absent in Paluxysaurus. 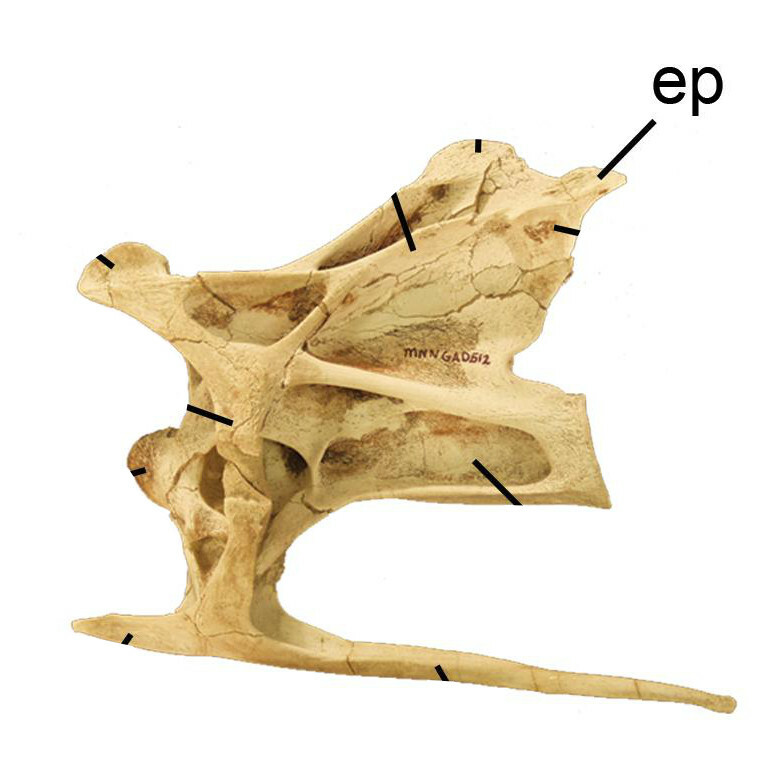 Evaluating the proposed synonymy of Paluxysaurus and Sauroposeidon is left as an exercise for the reader. 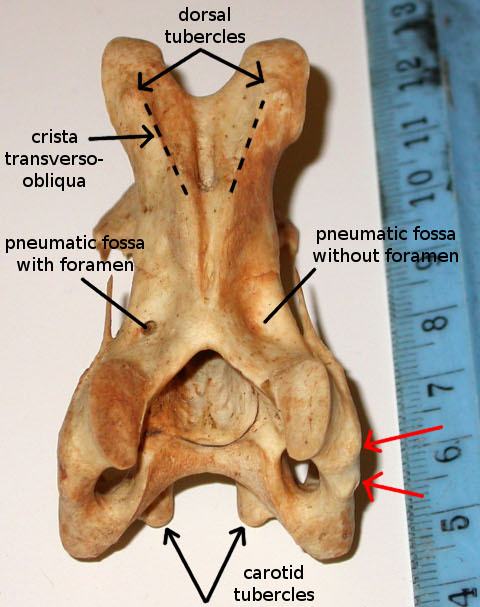 MIWG.7306 is a cervical vertebra of a large titanosauriform from the Wessex Formation (Barremian) of the Isle of Wight. 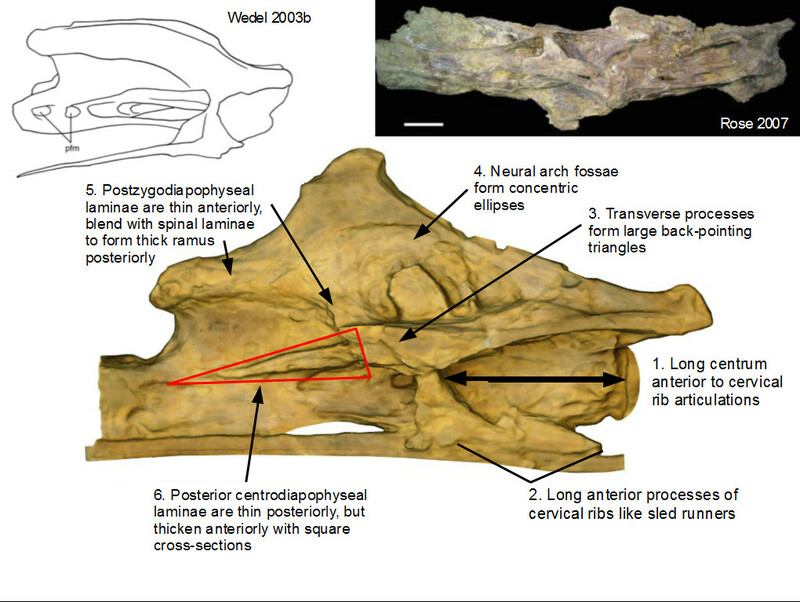 The specimen shares several derived characters with the holotype of Sauroposeidon: an elongate cervical centrum, expanded lateral pneumatic fossae, and large, plate-like posterior centroparapophyseal laminae. In all of these characters, the morphology of MIWG.7306 is intermediate between Brachiosaurus and Giraffatitan on one hand, and Sauroposeidon on the other. 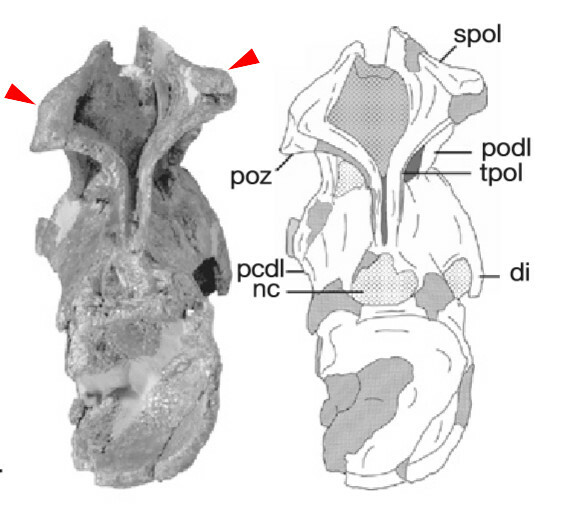 MIWG.7306 also shares several previously unreported features of its internal morphology with Sauroposeidon: reduced lateral chambers (“pleurocoels”), camellate internal structure, ‘inflated’ laminae filled with pneumatic chambers rather than solid bone, and a high Air Space Proportion (ASP). 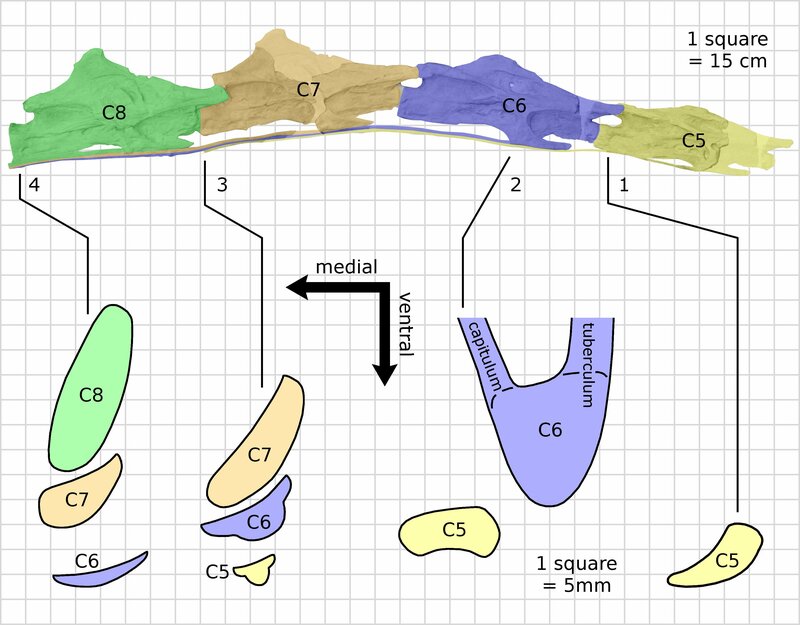 ASPs for Sauroposeidon, MIWG.7306, and other isolated vertebrae from the Wessex Formation are all between 0.74 and 0.89, meaning that air spaces occupied 74-89% of the volume of the vertebrae in life. 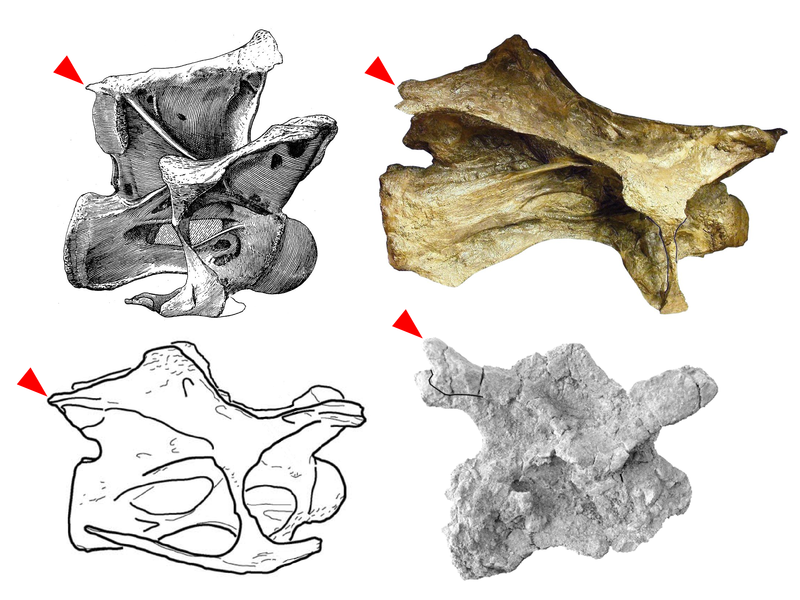 The vertebrae of these animals were therefore lighter than those of brachiosaurids (ASPs between 0.65 and 0.75) and other sauropods (average ASPs less than 0.65). Check this out: according to at least some versions of the Mannion et al. 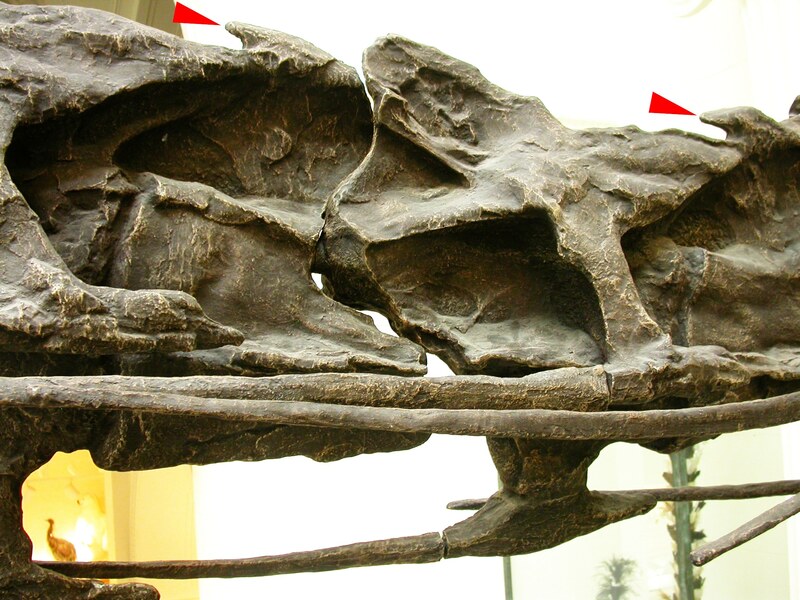 (2013) tree, Sauroposeidon and Paluxysaurus are part of a global radiation of andesaurids in the Early and middle Cretaceous. Cool! 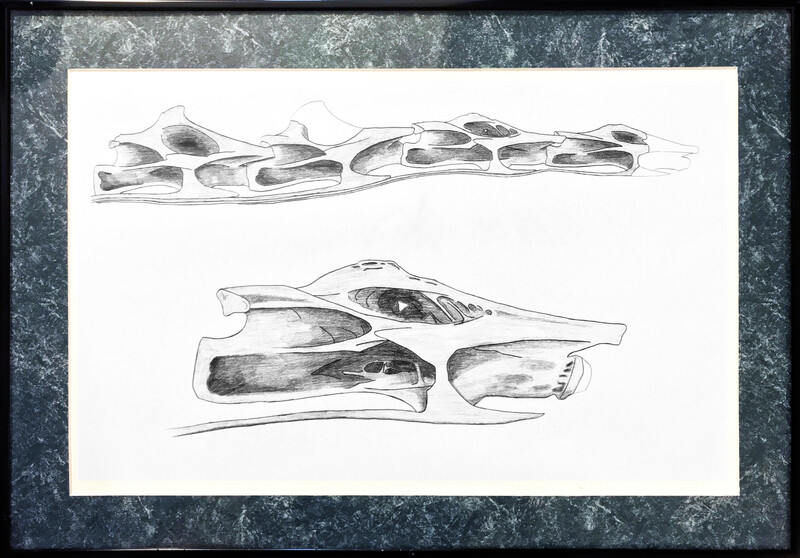 Sauroposeidon and MIWG.7306 were originally referred to Brachiosauridae. 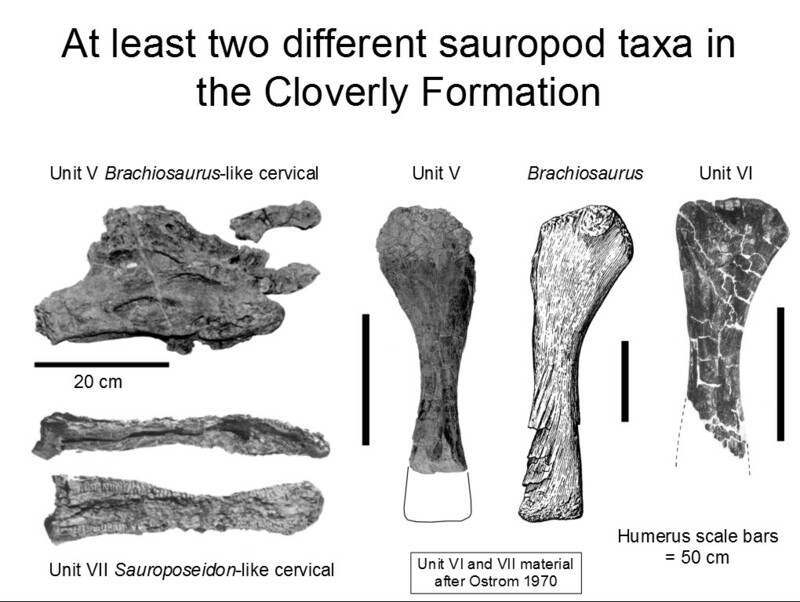 However, most recent phylogenetic analyses find Sauroposeidon to be a basal somphospondyl, whether Paluxysaurus and the Cloverly material are included or not. 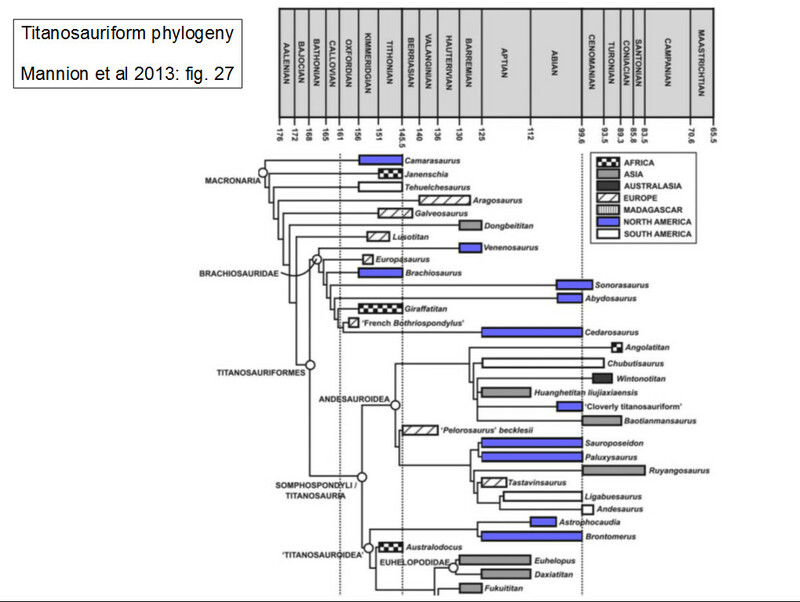 Given the large number of characters it shares with Sauroposeidon, MIWG.7306 is probably a basal somphospondyl as well. 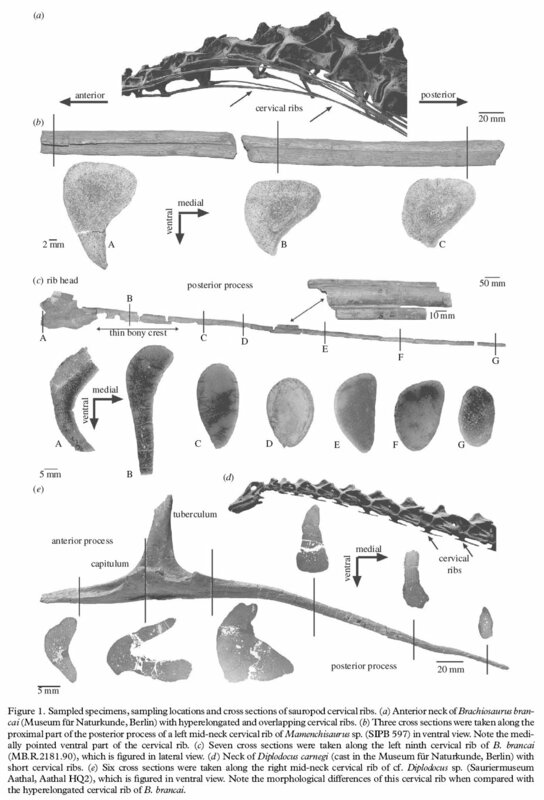 But genuine brachiosaurids also persisted and possibly even radiated in the Early Cretaceous of North America; these include Abydosaurus, Cedarosaurus, Venenosaurus, and possibly an as-yet-undescribed Cloverly form. 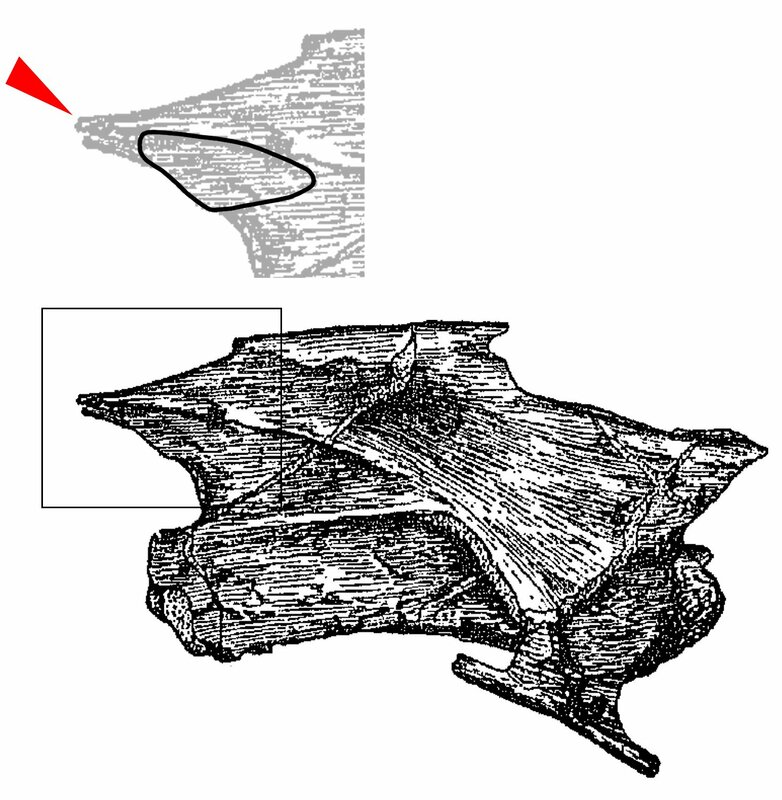 The vertebrae of Abydosaurus have conservative proportions and solid laminae and the bony floor of the centrum is relatively thick. In these characters, Abydosaurus is more similar to Brachiosaurus and Giraffatitan than to Sauroposeidon or MIWG.7306. 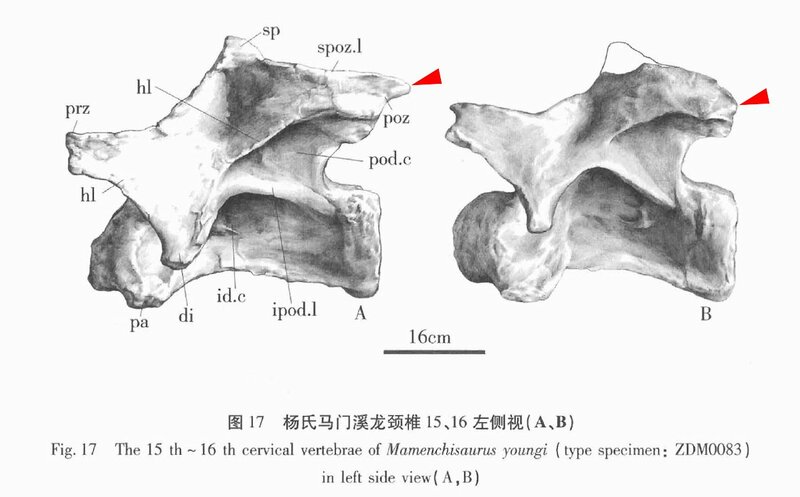 So not all Early Cretaceous titanosauriforms were alike, and whatever selective pressures led Sauroposeidon and MIWG.7306 to evolve longer and lighter necks, they didn’t prevent Giraffatitan-like brachiosaurs such as Abydosaurus and Cedarosaurus from persisting well into the Cretaceous. 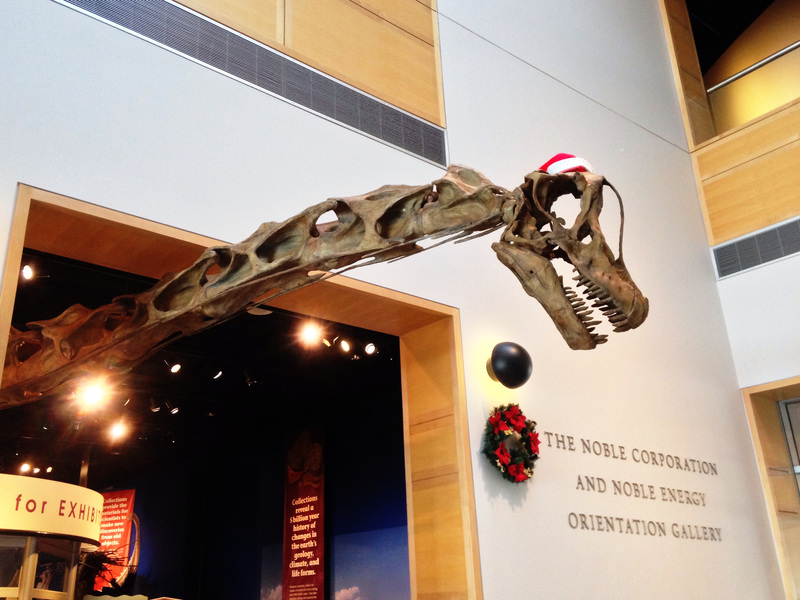 The evolutionary dynamics of sauropods in the North American mid-Mesozoic are still mysterious. 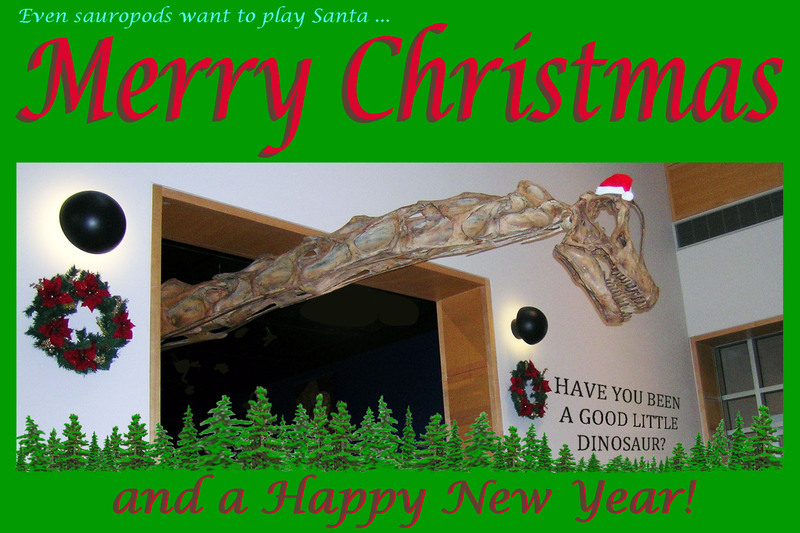 In the Morrison Formation, sauropods as a whole are both diverse and abundant, but Camarasaurus and an efflorescence of diplodocoids account for most of that abundance and diversity, and titanosauriforms, represented by Brachiosaurus, are comparatively scarce. During the Early Cretaceous, North American titanosauriforms seem to have radiated, possibly to fill some of the ecospace vacated by the regional extinction of basal macronarians (Camarasaurus) and diplodocoids. 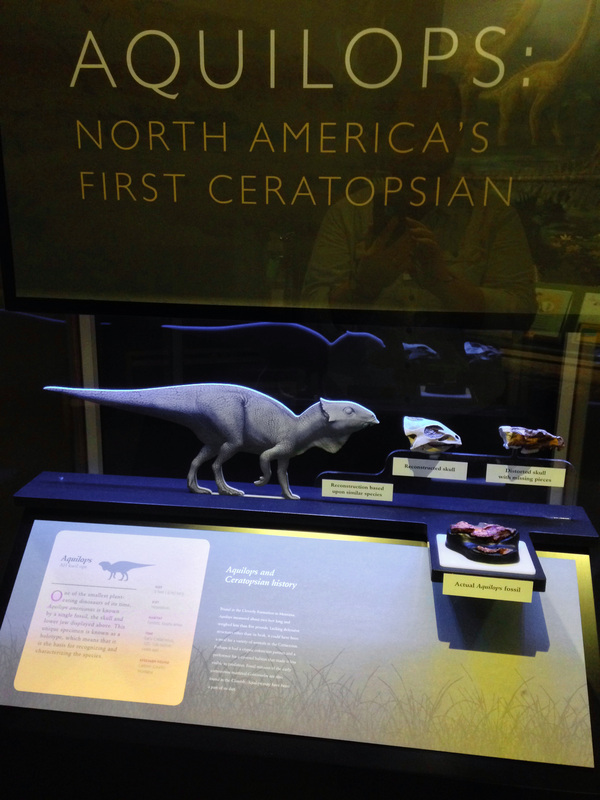 However, despite a flood of new discoveries in the past two decades, sauropods still do not seem to have been particularly abundant in the Early Cretaceous of North America, in contrast to sauropod-dominated faunas of the Morrison and of other continents during the Early Cretaceous. That final slide deserves some explanation. On the way back from the field on Saturday–the night before my talk–a group of us stopped at a burger joint in Hanksville. 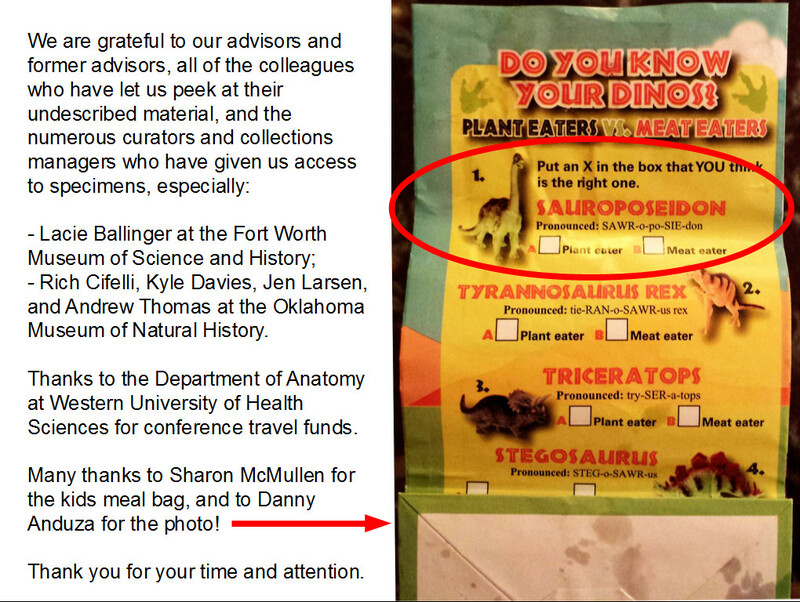 Sharon McMullen got a kid’s meal, and it came in this bag. 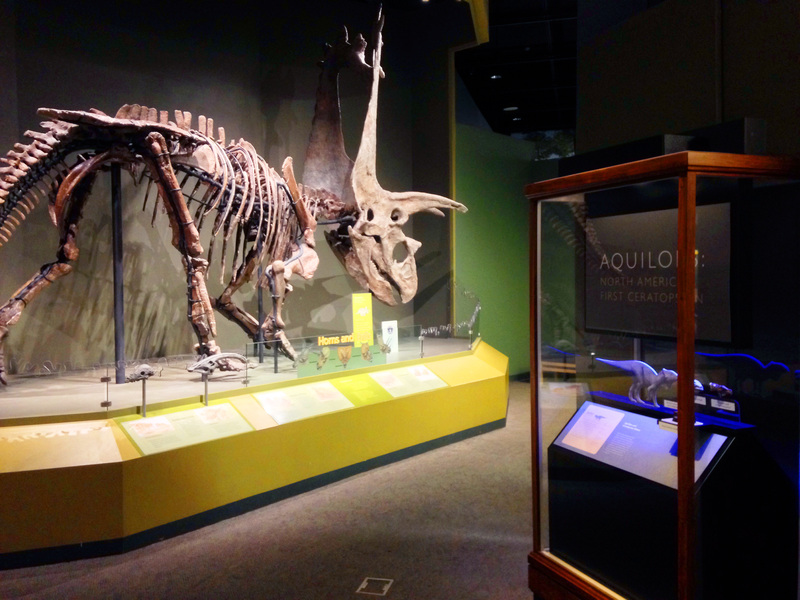 We took it as a good omen that Sauroposeidon was the first dinosaur listed in the quiz. For the full program and abstracts from both days of talks, please download the field conference guidebook here.